I often write about my colleagues and projects on the East Coast, but in every post I try to find lessons and strategies that are applicable to communities nationwide. Most people would agree – the Meatpacking District in New York City is a unique place. The area has changed drastically in the past decade. Today it is home to the High Line, a section of former elevated train tracks that have been redesigned as an aerial greenway – the first and so far only such park in the nation. This amazing amenity has spurred rapid community change. By 2009, more than 30 real estate projects were under construction nearby, and the local business district has turned into a high-end fashion mecca, with the like of DVF and Stella McCartney opening up shops. 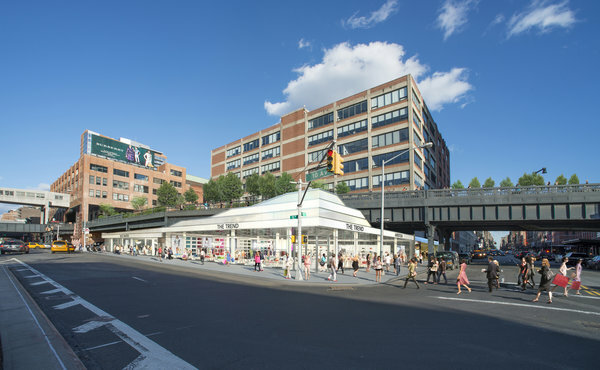 With asking rents from $200 to $500 a square foot, you might be wondering how the Meatpacking District might hold lessons for other communities. Believe it or not – there are a few universal lessons that offer insight for other communities. The use of a non-traditional, non-retail anchor to drive visitation to the district. In 2011, the High Line welcomed 3.7 million visitors. The spending power of those visitors is keenly visible in nearby streets and in businesses. Unlike a managed mall environment, where the retail anchor is the primary driver of visitation, urban communities have a myriad of ways to drive traffic. Whether it’s a tremendous local park, or an activity packed library, these visitation drivers are the “new” downtown anchors. As you consider communicating new business opportunities to retailers, don’t forget to map and quantify the visitors to these non-retail anchors. They can be as important, or more important, than any traditional retail anchor. Whitney Museum under the High Line. Continued efforts to improve tenant mix and co-locate anchors through new development. As if the High Line weren’t enough, today’s New York Times speaks to the coming of the Whitney Museum. As a broker said in the article “There are pockets of vacancies, which means the side streets aren’t doing as well as they could, so a project that will offer a variety of stores and will attract shoppers and increase foot traffic is just what is needed.” The project will offer a single retail tenant up to 16,000 sf of space – a unique offering in a district replete with smaller spaces in historic buildings. Efforts to reduce fractured ownership. According to Joe Sitt, chief executive of Thor Equities, which has been buying property in the area in an effort to become the largest landlord, “So far, ownership has been very fractured, so the development of the area hasn’t really moved in unison. Our hope is that by assembling so many properties we can help guide the strategy.” The ability to control and manage tenant mix on a large scale is an extremely powerful tool. In part because a developer who controls a critical mass of property can curate tenant mix more appropriately. This also give them the flexibility to offer deals to unique tenants, for example, which creates demand and drives up sales per square foot for other tenants, thereby offsetting any loss incurred. People in the retail real estate industry know that different kinds of retailers have varied abilities to pay rent. A jewelry store, for instance, typically pays higher rent per square foot than a coffee shop. An electronics store typically pays higher rent per square foot than a furniture store…and on and on. So the ability to control a critical mass of retail space enables a developer to offer a more varied and interesting range of retail offerings that create a higher average rent per square foot, even if an individual store may be paying less. On the other hand, when ownership is fractured, every owner is playing to attract the highest paying tenant. The results of this zero sum game can be seen in commercial districts everywhere, from a plethora of banks on 125th Street in Harlem to the lack of any food or beverage offerings on 34th Street in Herald Square. Albeit not every community faces the intense demand seen in either of these districts, we can still surmise that the benefits of reducing fractured ownership are universal. Excellent web site.Such an inseparable and good post here.Through this post i able to get fresh and new knowledge.Keep up sharing this type of informative information above here.